RSVP for Sweet Dreams Story Makers, Workshops, and Community Happenings! 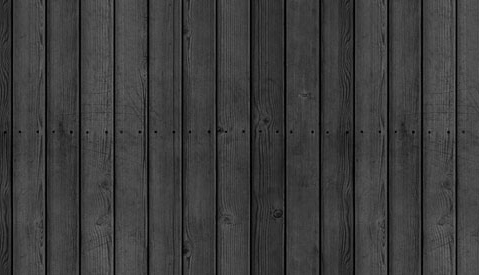 Updates about our program and other FREE events in the community. Sweet Dreams Story Makers - For ages birth through grade 3! Starts Thursday, 9/22, at 6:30pm. Workshop on Monday 9/26. Terrific Two's. 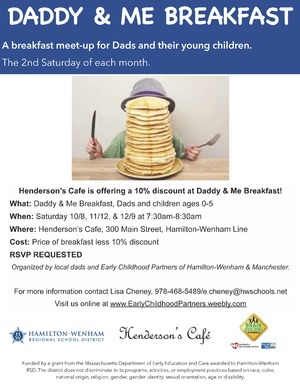 One monthly groups at Henderson's Cafe & Wenham Museum. FREE Upcoming Workshops and Speakers in the community. Ages & Stages. Learn about your child's development. Weekly Playgroups! Sweet Dreams Story Makers and Musical Story Time Jam! 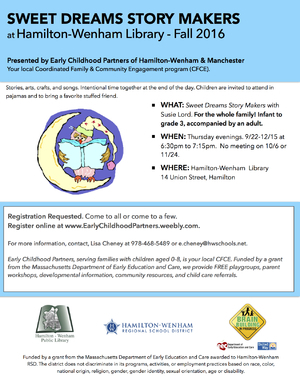 Sweet Dreams Story Makers starts on Thursday, 9/22, at 6:30pm to 7:15pm at the Hamilton-Wenhan Library. This group is for families with children infant through grade 3. Join Susie Lord for songs, stories, and a fun activity or craft. Children are welcome to come in pajamas and bring a favorite stuffed friend. This thursday Susie will read stories about birds. After story time get ready to paint with feathers! 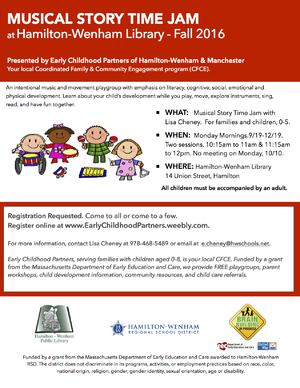 Musical Story Time Jam is on Mondays. There are two sessions: 10:15am to 11:00am and 11:15am to 12pm. Ages 0-5. Hamilton-Wenham Library. This groups runs 9/19 -12/19. An intentional music and movement playgroup with emphasis on literacy, cognitive, social, emotional, and physical development. Learn about your child's development while you play, move, explore instruments, sing, read, and have fun together. RSVP HERE. TIP! Next week, on 9/26, a parent workshop will take place immediately following the 11:15am to 12pm Jam. Maura Letourneau, trained by Positive Solutions and a Behavior Consultant, will lead Terrific Two's. See below for more information. Parent workshop. Terrific Two's! 9/26. Once monthly programs that meet the second Friday and Saturday of each month. Next dates are Saturday 10/8 and Friday 10/14. Poppets Playdates A new offering this fall, “poppets” are what the colonial children called their little cloth dolls and what adults lovingly called the children themselves. This program for toddlers 18months to 3 yrs. will be a sensory-rich, socialization experience. Offered from 9:30am - 10:00am on the same days as M is for Museum. 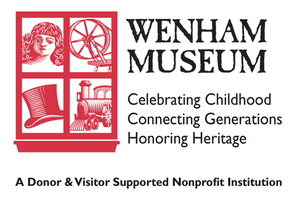 M is for Museum Wenham Museum educators introduce young children to the world of museums in a fun interactive way, combining early literacy and socialization. Targeted to children 3 and up, each session will focus on a particular part of the collection, an exhibit or a seasonal theme. Offered from 10:30-11:00 am on the second Friday of most months. Please note the November date change! October 14 - In the Makery, we will explore our creativity and engineering skills. Poppets will build and stack and play with building toys. M is for Museum will read Scraps by Lois Ehlert and make a toy from recycled materials. November 18 - (November 11 is Veteran’s Day so our November meeting will be moved to November 18). In the Claflin Gerrish House, Poppets will look at objects in the house and sing some very old nursery rhymes and songs. M is for Museum will read Over the River and Through the Woods and talk about how we celebrate Thanksgiving today vs. how it was celebrated in the 1800s when it became an official holiday. December 9 – Train Time will be in full swing and Poppets will look at the exhibit and play with some small toy trains. M is for Museum will also examine the train exhibit, read some new train themed books, and make a train themed craft. Poppets and M Is For Museum are FREE ENTRANCE TO THE MUSEUM with RSVP via Early Childhood Partners/CFCE. CLICK HERE. Upcoming Parent Workshops and Speakers. 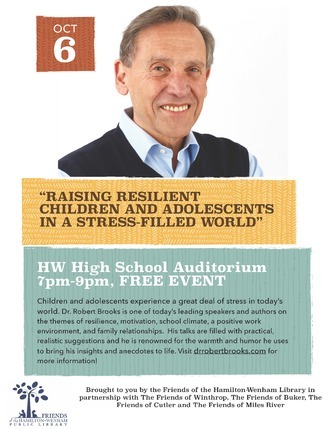 Raising Resilient Children & Adolescents in a Stress-Filled World Thursday, Oct. 6 at 7:00pm - 9:00pm at the Hamilton-Wenham Regional High School. Featuring international presenter and author of 16 books, Dr. Robert Brooks. Learn factors that aid students in overcoming challenges and strategies for nurturing self-discipline, care and hope. Free and open to the public, funded by the Friends of the Library, with support from Friends of Buker, Friends of Cutler, & Friends of Winthrop. 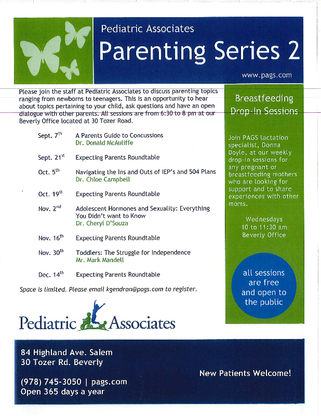 FREE parenting workshops at Pediatric Associates in Beverly. Workshops are from 6:30pm to 8pm at their Beverly office, 30 Tozer Road. Space is limited and your must register through their office by emailing kgendron@pags.com. 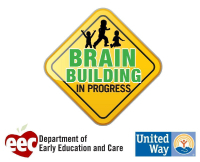 10/5: Navigating the Ins and Outs of IEP's and 504 Plans. 11/30: Toddlers: The Struggle for Independence. They also offer free Breast Feeding Drop-In sessions on Wendnesdays from 10am to 11:30am. 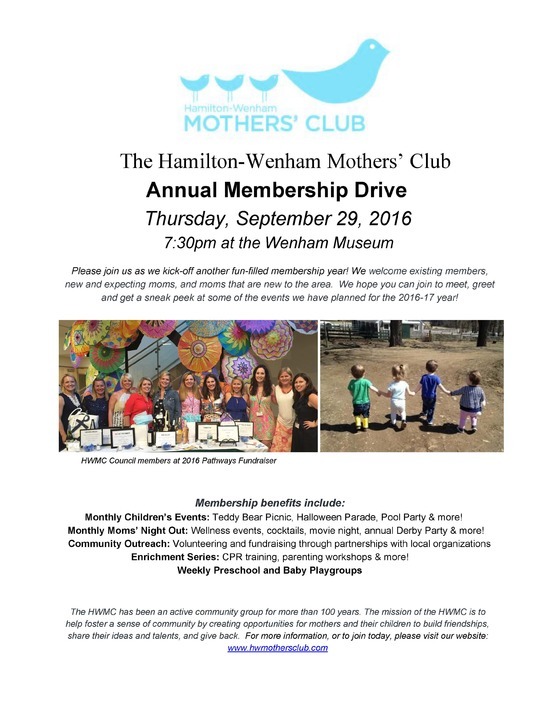 The Hamilton-Wenham Mother's Club and the Manchester Mother's Club are offering opportunities to connect with even more families.Check them out! 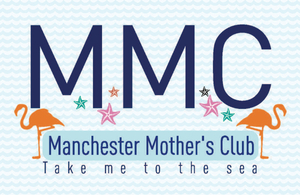 The Manchester Mother's Club is open to all. You do not have to be a Manchester resident! For more information, visit the MMC Website. 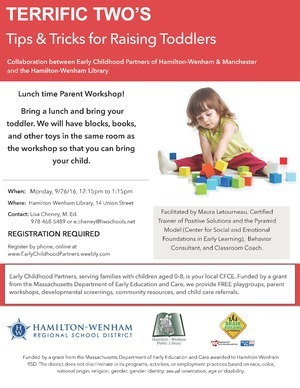 Interested in learning more about your child's development and to discover ways to support your child at home? The Ages & Stages parent-directed questionnaire is now online. The questionnaire is available for children ages newborn through age 5. Simply respond to this email and I will send you a link. Or, if you prefer, we can set up a time to meet at my office or at the library. If you take the survey online we will set up a time to speak in person to go over the results. CLICK HERE to learn more.